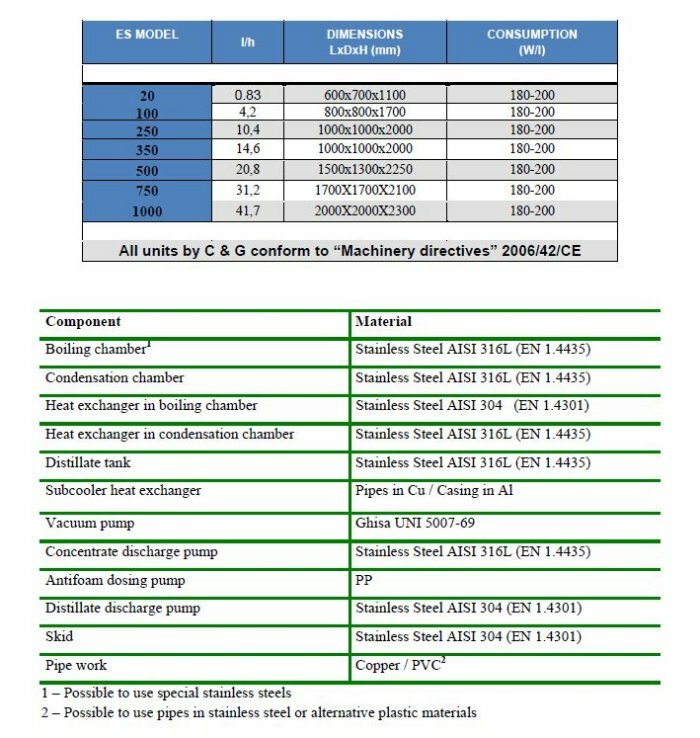 C&G - ES Series - Wastewater Treatment / Vacuum Wastewater Evaporators - Vacuum Evaporators by C&G Depurazione Industriale S.r.l. 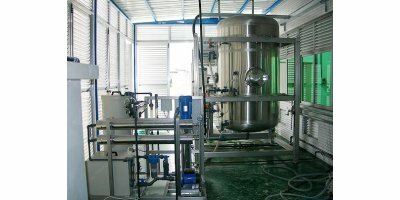 The ES series are horizontal development evaporators with an outer shell for the heat exchange, while the distillate condensation chamber is located above this. The vacuum system guarantees minimum energy expenditure. The distance between the free surface of the effluent being treated and the collection plate prevents drag out. 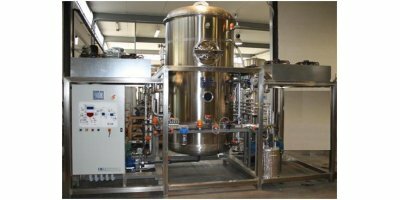 and therefore guarantees a higher purity in the distillate. 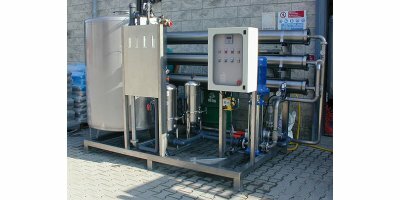 C&G Depurazione Industriale Sri has been operating since 1971 in the industrial wastewater treatment sector. The Know-how acquired from the design and construction of over 3000 plants, sold both in Italy and abroad, encourages our constant growth, research and innovation, and allows us to propose a complete and personalised service to our customers. Countries where the C&G logo is already well known and appreciated are: Italy. France. Belgium. Spain. Holland. Slovakia. Slovenia. Poland. Turkey. Greece. Russia. Lebanon. UAE. USA. Mexico. Taiwan, China. India. Indonesia. Malaysia. Japan. Brazil and others. 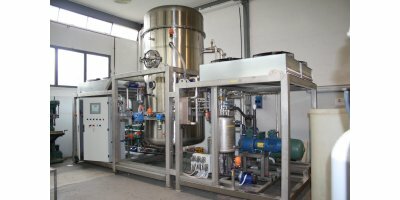 C&G supplies equipment and support technologies to a wide range of production sectors, all however with a common objective: to improve the conditions of a particular liquid. The ES evaporator series are plants which use a heat-pump. There is a refrigerant circuit where the high pressure is used to yield heat to the wastewater and bring it to boil, and the low pressure is used to re-condense the distillate produced by removing the heat. The system used to create a vacuum within the boiler includes the use of a centrifuge pump and an ejector. This extraction system guarantees a residual pressure of 33 nibar inside the evaporator. No pump is necessary for the discharge of the distillate. The distillate leaves from an accumulation tank placed on the skid, which is kept chilled by the refrigeration circuit. The ES evaporator series have been designed to reach a highly compact concentrate which can arrive at a dry solution. The scope of these machines is in fact the maximum reduction of the product treated. 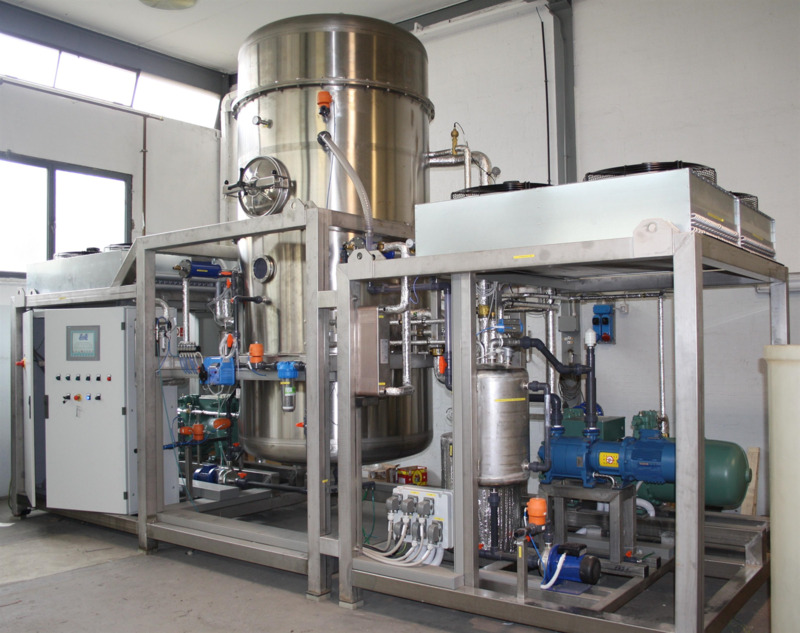 The concentrate is therefore not possible to extract using a pump and discharge is manual through the door positioned on the side of the boiling chamber. C&G evaporators can work unattended and continuously 24/24 hours thanks to control through PLC. The use of simple, logical software allows easy control and immediate set up of the working parameters. The use of a synoptic (optional on all models) guarantees a rapid and intuitive global control of the workina of the machine. No reviews were found for C&G - Model ES Series - Vacuum Evaporators. Be the first to review!